He was joking. I wasn’t. 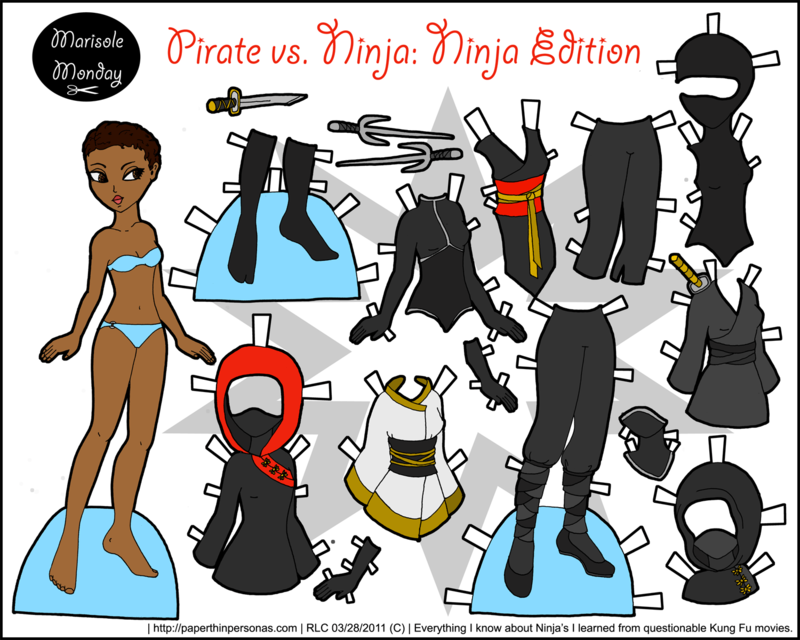 I actually gave some thought to the matter and decided I could do both a ninja and a pirate version of the paper doll. Today is the ninja and then next week, there will be a pirate paper doll for Marisole. I did a pirate paper doll a while ago, but I was never really pleased with how it turned out. So, I decided I should have another go at it. In paper dolls, unlike in life, there are plenty of second chances. On a totally unrelated note, I was looking at my poll results and I noticed that Marisole won as the favorite paper doll by a landslide. While I always thought she would win, I didn’t think she’d win by as much as she did. So I am curious, why Marisole won. To help answer this question, I have developed a contest. The question is: Which paper doll series on the blog is your favorite and what makes it your favorite? A one word answer will not count, the “why” is very important to me. 1) One answer per person. 2) Contest will run for this week. 3) At the end of the week, I will put the names of everyone who answered into a hat, draw one randomly, and announce the winner on next Monday with the Marisole post. The Prize: A custom paper doll for a series of your choice- Curves, Marisole, Pixie & Puck or Flora (though Flora has to stay in the Regency Era). All right, I look forward to reading people’s answers. I love Marisole and Curves, but my favorite would have to be the pixies (and Puck, of course). I think this is mainly because of my special needs daughter. We share a love of paper dolls and her favorites are any really cute ones with big eyes, especially if I can add transluccent wings to them and make them into fairies for her. Pixie is just perfect for that use! I like Marisole because it is so versatile and colorful and pleasurable to my visual senses. I love the Curve doll for two reasons: the first is that she shows that beauty can be curvy; you don’t have to be model thin to be attractive. Plus, she has some awesome outfits and have the benefit that I can print them out and color them however I see them to be. I can print them out multiple times and, just like my own closet, have a few of the same style in just a different color or print. While I like Marisole, Curves just resonates with me so much more than Marisole. Well, I want to say a thank you to everyone whose replied so far. This has been wonderful for me to read. It’s really interesting and useful to know what and why people like the blog. My favorite paper doll would have to be Marisol. I like her because she is so different from all the other paper dolls I have ever seen. She does not follow a set theme. Marisol always brightens up my Monday!! While I do like Marisole, for all the reasons stated by others, she’s not my favorite. My favorite is Curves, because she is different from most other paper dolls out there. She’s “curvy” and her wardrobe is amazing. It’s refreshing to see a PD who isn’t a skinny girl. Second: When hitting the “previous” button the image that appears is the Curves sleepy time doll, not the Marisole ninja (which is accessable through the PDF link). Last: Curves is my favorite by about a millimeter more love than Marisole. I can colour Curves, and she’s curvy. I love to colour and I love curvy. But they’re ALL awesome, cause there’s so much variety. I like the Dictionairy Girls the most. They’re so curvy and have different ethnic groups. And I also like their retro clothes. I wish the series hadn’t been discontinued. I like Marisole the best. For all of the reasons that other people wrote!!! !